Apex Court ordering acquisition of ATI’s landed property at Bambooflat could pave the way for settlement of workers VRS dues that has been pending for the last more than a decade. 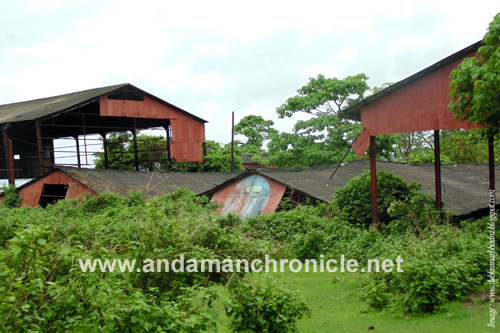 Port Blair, Feb 23: More than 800 workers of M/S Andaman Timber Industries Ltd (ATI) have not been paid retirement and statutory dues admissible to them since the factory closed in the fall of 2000, writes Debkumar Bhadra in his blog titled Musings of an Islander. Estranged workers raised the issue in every available forum and even got a Labour Court Award in their favour but nothing could turn the tide. M/S Andaman Timber Industries Limited had its Plywood manufacturing factory at Shore Point Village near Bambooflat Jetty in South Andaman. The factory started sometime in the early 60’s with modest two digit workforce, soon emerged as the frontrunner providing livelihood, directly or indirectly to a large section of rural South Andaman. At its peak the factory operated in three shifts with strength of about 1200 workers. After four decades of operation, the factory was closed on 9th day of October, 2000 apparently without observing provisions mandated under Industrial Disputes Act, 1947. The workmen and their Union raised the issue with the management several times, but to no anvil. Ultimately the then Hon’ble LG at the instance of Member of Parliament convened a meeting at Raj Nivas wherein ATI management agreed to pay workers retirement and statutory dues in a specified time frame, but not without caveat; payment was linked to liquidation of company’s movable and immovable assets. Since the agreement had involvement of Raj Nivas, A&N Administration invoked Section 17 of Land Acquisition Act and completed the daunting task of surveying, inventorisation, reckoning market value of company’s assets in a record time of 12 months and acquired 8.86 hectares of company’s immovable property at Bambooflat, for Development of Port related facilities. Summarily, compensation to the tune of Rs 3.03 Crore was paid to factory management during Sept 2002. The blogger points out that this amount, according to the agreement should have been disbursed to settle workers VRS and other statutory dues. But ATI management not only broke its promise, it also breached the Labour Court Award and to make matters further worse, slapped a lawsuit before vanishing with compensation worth Rs 3.03 crore in its pocket. Referring to the latest order of the Supreme Court, Bhadra wrote that the legal wrangle that has been cited and used as a cover to prolong the issue has culminated. In its order dated 28 Nov, 2013 the Collector of Land Acquisition has been ordered to make and publish an award in respect of the remaining land and pay compensation to M/S Andaman Timber Industries within four months. This would mean acquisition of company’s property and payment of compensation to the tune of Rs 14,20,97,426/- (less Rs 3.03 Crore already paid) to the factory management. The blogger also stressed on the need to remain vigilant to past experience and deemed it extremely necessary to attach pre-condition for release of compensation payment to the factory management. It urged the authorities to make it mandatory for the ATI management to clear VRS and other statutory dues payable to the workers before the compensation is paid to factory management. Concluding the post, he referred to a Labour Court Award published in A&N Gazette No 52/04/F No 3-356/2003-Labour dated 05/03/2004 and wrote that instant ruling gave concerned authorities the locus standi to take a final call in the matter. The authorities could make use of the opportunity and cause implementation of the labour court decree, which ordered immediate payment of workers dues way back in 2003.